ARLINGTON, VA. — Today’s grisly takes on zombies and terror shared honors with some of Hollywood’s oldest monsters in just-released results of the 2013 Rondo Hatton Classic Horror Awards. ‘Cabin in the Woods,’ Joss Whedon‘s homage to 80s teen thrillers, was named Best Horror Film of 2012 while AMC’s hit series, ‘The Walking Dead,’ took the top television prize for the second straight year in the awards decided by fans and fantasy professionals worldwide. Voters also embraced Universal Studios’ massive effort to digitally restore its catalog of archetypal monsters such as Frankenstein, Dracula, The Wolf Man and the Creature from the Black Lagoon. The studio’s Blu-Ray set, ‘Universal’s Classic Monsters: The Essential Collection,’ was voted Best DVD Collection, and the 1931 ‘Dracula’ was voted the year’s Best Restoration. In addition, Universal’s 1948 comedy perennial, ‘Abbott & Costello Meet Frankenstein,’ was named Best DVD as voters celebrated recent Blu-Ray upgrades of monster classics. 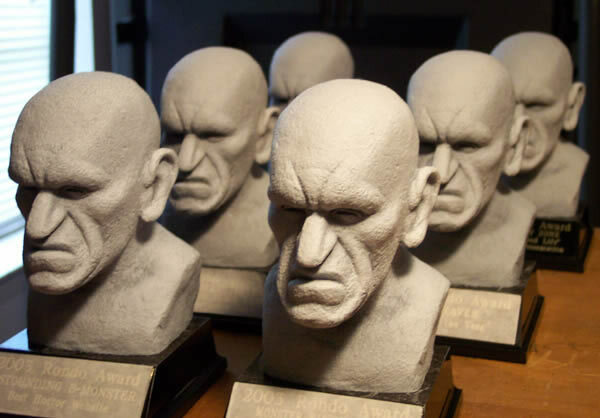 The Rondo awards, named after Rondo Hatton, an obscure B-movie villain of the 1940s, recognize the best in classic horror research, creativity and film preservation. This year’s e-mail vote, conducted by the Classic Horror Film Board, an 18-year old online community, drew a record of more than 3,400 votes as fans chose among 35 categories. And horror enthusiast Simon Rowson was named ‘Monster Kid of the Year’ — the award program’s highest honor — for his work discovering snippets of footage in Japan that had been cut from the original release of Hammer’s ‘Dracula’ with Christopher Lee in 1958 (Retitled ‘Horror of Dracula’ in the U.S.). As a result of his efforts, a new restored version of the film has been released in Britain. An explosion of new ‘monster magazines’ was reflected in a decision to honor magazines devoted to today’s blood-soaked new releases as well as publications that cater to more classic-oriented films of the 1930s and 1950s. Many of the Rondo winners will receive Rondo busts, sculpted by Kerry Gammill, at the Wonderfest convention in Louisville in May. Further information, including runners-up and all the nominees, can be found at RondoAwards.com.